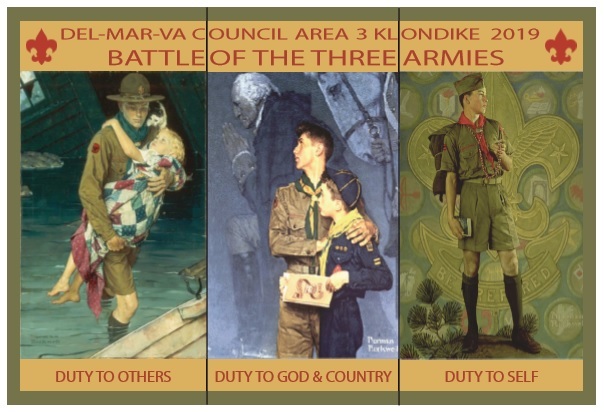 Registration for Klondike will also reserve space in a tent site at Henson for your troop to tent camp. Download the Leader's Guide Here! New and Improved Event Structure! The Campfire Program on Saturday night will be hosted and run by members of the O.A. Troops participating in the Klondike Derby are encouraged to participate by performing a skit, song or cheer. Assignments will be given Friday night at the Leader Meeting. Tent sites will be issued on Friday night at the time of Check-In. After 1/12/2019 a fee of $5.00 will apply to all Adult Registrants. After 1/12/2019 a fee of $5.00 will apply to all Scout/Venturer/Explorer Registrants. All refund requests should be directed to Del-Mar-Va Council Outdoor Programs, 1910 Baden Powell Way, Dover DE 19904 or by email to camping@dmvc.org. Refunds for registered individuals not attending the event may be given if the Outdoor Programs office is notified in writing at least 14 days prior to the start date of the event. There will be no refund for cancellations within two weeks of the event except for medical reasons. Partial refunds for cancellations due to medical reasons will require a doctor's note.